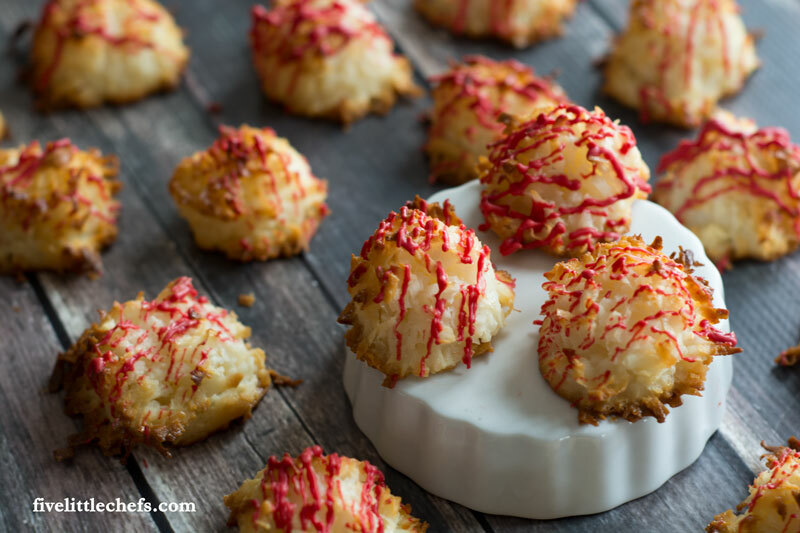 Coconut Macaroons are one of my favorite occasional treats. The coconut is toasted on the outside making a crunchy crust while the inside is still soft and chewy. This recipe has only 5 ingredients, including sweetened condensed milk, which you probably already have in your pantry. 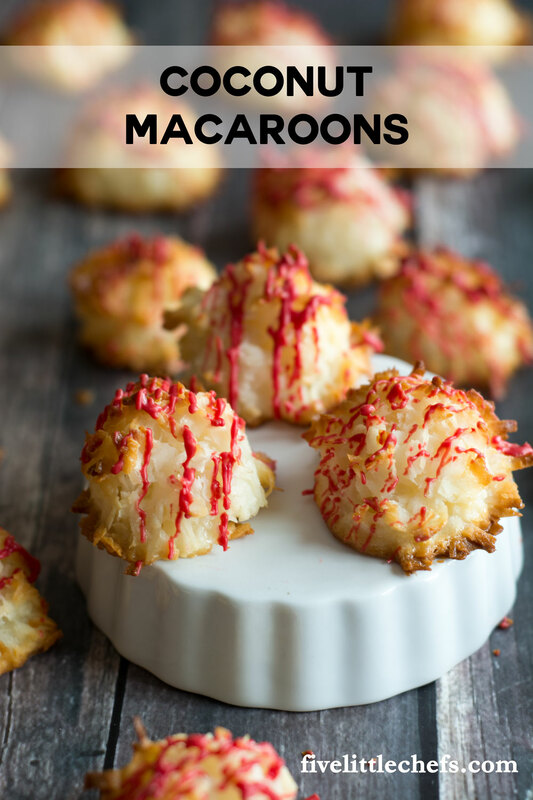 Coconut macaroons is truly an easy recipe. I like to use a small cookie scoop to help shape the cookies. Silpat or parchment will both work fine for the cookies to slide right off. If you need to fine tune the shape of the cookies with your fingers make sure they are a little wet or the cookie will start to come apart. I like to make these festive for Valentine’s Day by melting red Wilton candy melts to decorate the tops. Coconut Macaroons are crispy on the outside yet soft and chewy on the inside. Decorate them for Valentine's Day with some red Wilton candy melts. In a medium bowl combine the coconut, condensed milk and vanilla extract. Set aside. In another bowl add the egg whites and salt. Using an electric mixer, beat the egg whites and salt until stiff peaks form. Use a large spatula to fold in the egg whites into the coconut mixture. Use a small cookie scoop to create mounds of the mixture on the parchment lined baking sheet about 1 inch apart. Bake for about 25 minutes or until the tops are lightly golden and the edges and bottoms have a little more color. After the macaroons have been pulled from the oven add the candy melts to a microwave safe bowl. Microwave on defrost for 1 minute then stir. Continue in 30 second intervals stirring in between until fully melted. Using a fork dip it into the melted candy then wiggle it above the macaroons to create a lightly drizzled look. The cookies keep well in an airtight container for about a week. No Replies to "Coconut Macaroons"